L to R: Chuck Johnson (Aviators GM), Larry Koentopp, Rossi Ralenkotter, Don Logan (Aviators President/COO). LAS VEGAS: The Las Vegas Aviators professional baseball team, Triple-A affiliate of the Oakland Athletics, sadly announces today the passing of Larry Koentopp, at the age of 82. Koentopp, the majority owner of the Las Vegas Stars, brought his Spokane (WA) Indians Triple-A Pacific Coast League franchise to Las Vegas in September 1982, giving the city its first-ever Triple-A baseball franchise. PCL baseball was born in Las Vegas on April 10, 1983, before a crowd of 10,622 at Cashman Field. The then-Stars, in their brown, gold and burnt orange uniforms, defeated Salt Lake City, 11-8. The 1983 Stars, 80-62 record, team were inducted into the Southern Nevada Sports Hall of Fame on June 8, 2007. Las Vegas Triple-A baseball has provided the best in fun, family-oriented entertainment to the city for 36 years (1983-2018). The Las Vegas franchise won both of its PCL championships under his ownership in 1986 and 1988. The Stars were the recipient of the 1985 John H. Johnson President's Award, given to the franchise for "Outstanding Club Operation." 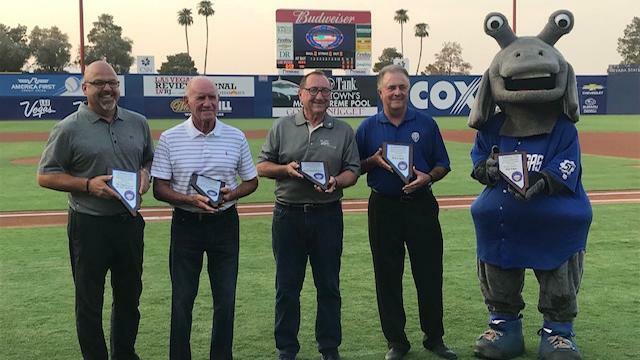 "Larry brought Triple-A professional baseball to Southern Nevada," Aviators President/COO Don Logan said. "He gave me my first opportunity in professional baseball 35 years ago and I will be forever grateful to him. He was an outstanding baseball executive and we are all saddened today by the news of his death." Koentopp was a three-sport all-state selection at Spokane's Gonzaga Preparatory High School. He then attended Gonzaga University where he was a standout baseball and basketball player. Upon graduation, he taught and coached in the Southern California school system, before returning to Gonzaga University to serve as Head Baseball Coach. He was then promoted to Athletic Director, becoming the youngest Athletic Director in school history. Koentopp then took the General Manager position with the Spokane Indians. Larry had been a long-time resident of Las Vegas since 1982. Larry is survived by his children, Juli (daughter), Kevin (son), Rita (daughter-in-law), Jake (grandson), Kery (daughter) and his brother Jack (brother) and family.